After travelling all the way from Kitale to the Tanzanian border town of Buzuruga in the hope of finding a bus conductor’ job, little did Robinson Mkwama know that he was just a disposable item in his friend Nathan Mutei’s get rich quick mission. For that, he will rot in prison for 17 years. 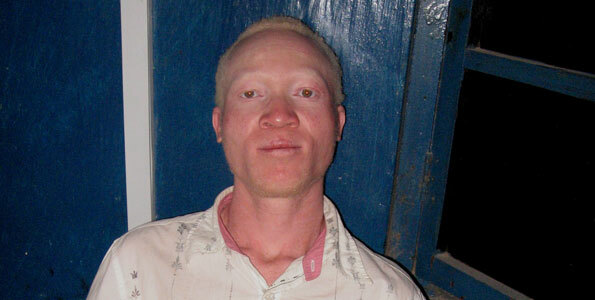 After luring the 20 year-old hawker to Tanzania under the pretext of securing him the job, Mutei had organized to sell his albino friend to human body parts for Sh22 million. But Tanzanian posing as customers pounced on Mutei and saved Mkwama from the painful and fatal eventuality that awaited him. Abandoned by his parents at an early age in Nairobi, Mkwama was brought up in an orphanage in Nairobi where he pursued his education to O’level. 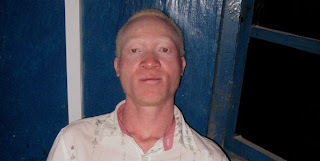 Last year, Mkwama was adopted by a business woman in Kitale who hired him as a watchman in her Motherland Hotel. For centuries, human body parts have been used as ingredients for witchcraft. To obtain body parts, body part death merchants kill in order to harvest specific organs. But things haven’t been easy for them with the advent of the nation-state in Africa where murder is a capital offence, meaning witchdoctors can only acquire these body parts from underground organ hunters. Cases similar Mkwama’s, where people disappear mysteriously, only for their bodies to be discovered several days later minus various body parts are so many in Africa that they are treated as routine crimes in some countries. According to the South African Police Service Research Centre reports, there is a belief that body parts taken from live victims are rendered more portent by their screams, which means victims must be subjected to pain before death. Ritual killings have been reported in Mozambique where the country’s Human Rights League has blamed them on the proliferation of witchdoctors from western Africa. Authorities have also confirmed that although most of the organs trafficked in that country are for transplants, extraction of organs for witchcraft also happens. Human skin appears to be one of the most sought-after organs by ritual killers in Africa. During the early 2000s, there were widespread cases of people being killed and skinned in Mbeya region of Tanzania and the Mwiki outskirts of Nairobi. Investigations by the media and police revealed there was a high demand for the human skin in Malawi, Zambia, Mozambique, South Africa where it fetched $2,400 (Sh180,000) to $9,600 (Sh180,000) depending on the age of the victim. In an effort to raise awareness about the trade in human skin Tanzania’s chief government chemist’s office kicked up a storm at an international business fair in Dar es Salaam by displaying skin and other human body parts. Nigeria has the highest number of occult killings in the continent. Not surprisingly, the vice has found thematic expression in the country’s vibrant film industry. According to Nigerian authorities, the killings are perpetrated by people commonly known as headhunters, who act at the behest of juju men. Cases of children being abducted and ritually slaughtered are so many in southwest Nigeria that they sparked a spate of murderous protests and mob lynching early last year that left more than 20 suspected kidnappers dead. The murder in London of a Nigerian child, which British police named “Boy Adam” for lack of positive identification, in September 2001, brought to international attention Nigeria’s ritual killings. Forensic examinations on Adam’s torso, found floating in River Thames, revealed that he was a native of Yoruba Plateau in Nigeria and the state of the body indicated a style of ritual killing practised in West and Southern Africa. Although this case came about barely ten days after the September 11 terrorist attack on the US, it prompted such a huge media coverage that retired South African President Nelson Mandela and Nigerian soccer star Nwanko Kanu joined the rest of the world in appeals for clues leading to the arrest of Adam’s killers.